Ostensibly the West Philly Runners get together every Wednesday night and run routes that are 2, 4, and 6 miles, but there are lots of little offshoots of that, one of which is Coach Emma's Saturday Long Run where we run anywhere from 8.5 to 14 miles depending on who's there and how we all feel after Friday night. 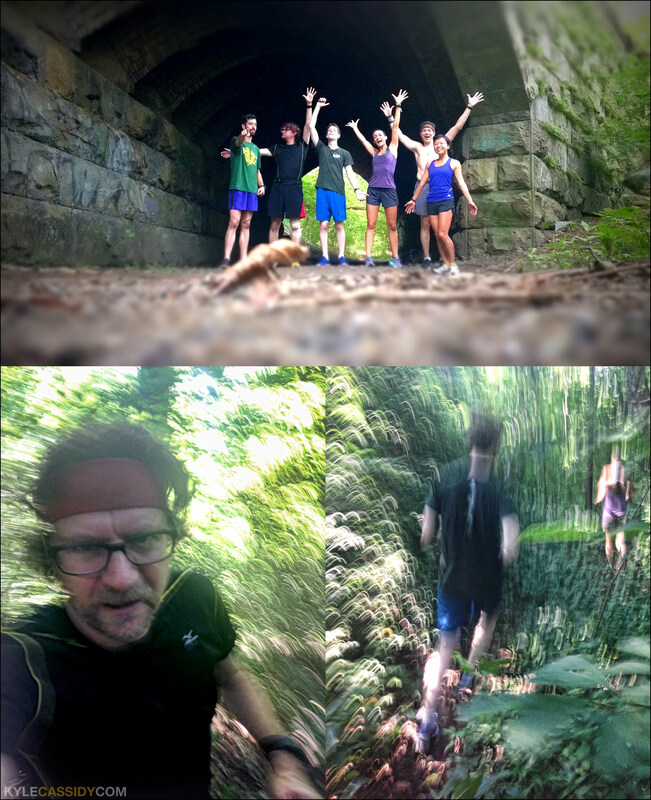 This past Saturday Alon headed the group and took us trail running, which I'd never done before. As soon as we hit the trail head the dreary feeling that I so often associate with actually-being-out-running went away -- the woods weren't the traffic-light littered streets of Philly, it was really beautiful. The trails were often no more than a foot wide and you'd need, occasionally, to leap over fallen trees or streams and it was exhilarating. I found myself, for maybe the first time, feeling like I wasn't pushing my body, rather my body was pulling me through these paths, showing me these wonderful things -- like this was the reward for all the hard work, a body that won't stop, legs that don't fatigue, sides that never ache. It felt like I'd never get out of breath (we were running significantly slower than normal because of all the turns and dense vegetation) and after a while I found myself thinking I've run six miles, how come I'm not tired? Somewhere along the line I got stung in the leg by a wasp which took my mind off of any other pain I might have experienced, later I found out that one other person got stung too, but that's the price you pay. Running through the forest, you may clickenzee to embiggen! It was a spectacular experience and I think it's also going to be Saturday's long-run. We split up after 10 miles and I slugged it out to 14 because my milage is sucking lately and I've been creeping my weight back up. People who are interested in doing the trail run but not running 14 miles can ride their bikes to the trail head and the trail run is about 5 or 6 miles, the pace is pretty easy, it's not like a 10k all out race, plus, nobody gets left behind. I'm really happy for you--that you've come to this place, emotionally and physically, where you are finding pleasure in the process of running and enjoying what your body can do. Congratulations! it's weird! really weird. feels like it's happening to someone else. I understand. I don't run, but having a tiny farm that I take care of by myself, I find myself hauling hay and bags of feed, that two years ago I couldn't have done. Heck, I've been known to load in 30-40 bales of hay and 300+ pounds of feed all in the space of an hour. I'm a 54 year old, overweight (but muscular!) woman with a bad back, flat feet, and knees with entirely too much extraneous chewed up cartilage. But by god, I do it! And it feels marvelous to be able to. Thanks for posting this. I was tempted to blow off today's session...but there you were, trying a whole new thing and enjoying the discoveries. Yeah, I'll be lacing on the shoes. excellent! sometimes you just have to gut it out the door.